Donatello has joined his Utrom friend Bydex and a Styracodon liason, Sellis, on a good will mission to a planet on the disputed border between Styracodon and Triceraton space. The trio is to peacefully investigate some strange happenings on the lush jungle world. Upon landing, they happen upon some ancient ruins from a culture that predates both the Styracodons and Triceratons. In fact, according to a pictograph carving, both of the alien civilizations stem from this culture, linking their histories (Sellis finds this concept repulsive). While investigating the ruins, Don happens upon some modern equipment and grows suspicious. Over the nearest ridge, they find their suspicions correct, as a unit of Triceratons are busy excavating what looks like a huge, ancient space craft. 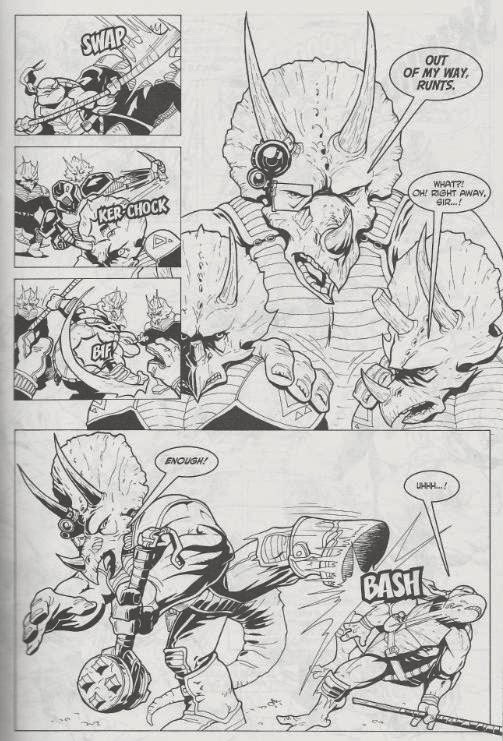 Sellis attempts to contact the other Styracodons on the Incisor, but the Triceratons are blocking all transmissions with the equipment aboard their nearby spaceship. One Triceraton cuts a hole into the ancient ship and enters. His presence causes the ancient ship to rise from the mountainside and begin hovering in the air. With no time to lose, Don and co. storm the excavation site and begin beating up Triceratons. Don throws down with Major Tritan and, after cracking a few ribs, finally defeats the behemoth. Bydex then gives Don a boost and launches him into the air, where he latches onto the side of the ancient ship and crawls in. Inside, the Triceraton finds the body of a Triceraton/Styracodon-like creature in the pilot’s seat. He touches it and the body disintegrates, but his mere presence causes the ancient ship to begin discharging weapons. The weapons blow up the Triceraton spaceship, allowing Sellis to call for backup from the Incisor. Don, meanwhile, attacks the Triceraton and, defeated, the Triceraton attempts to take control of the ancient ship by sitting in the pilot's seat. The energies of the ancient ship kill him. The ghost of the alien pilot then speaks to Don, explaining that the ancient ship was the ultimate weapon of its people and is powered by something called a “Soul Capacitor”. The Capacitor traps the essence of the pilot when they lose control of their emotions and both it and the Triceraton are now trapped in the ancient ship. It asks Don to align his spirit with the ship, focus and use that strength to destroy the Capacitor. Reluctantly, Don agrees and after recalling some words of encouragement from Splinter, he destroys the Capacitor, frees the spirits held within and escapes as the ship disintegrates. Later, onboard the Incisor, Donatello and co. are debriefed. The Styracodon Commander remarks that Donatello seems accustomed to such crazy adventures. Don and Bydex share a smile and remark that this was nothing compared to their last outing. 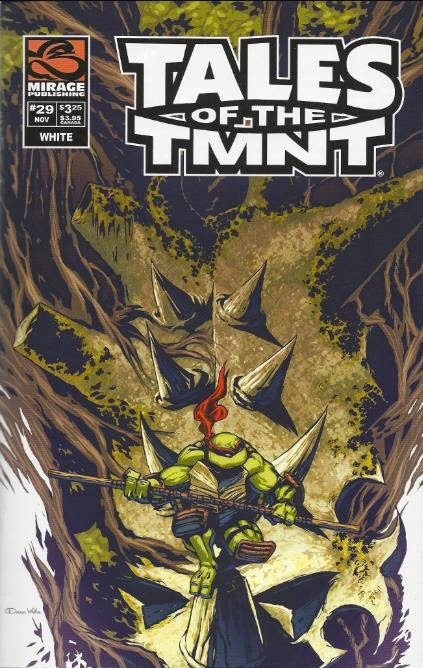 *This story takes place during the six month time gap in TMNT (Vol. 4) #5. *Styracodons will reappear in TMNT (Vol. 4) #13. *The story of Donatello’s and Bydex’s first adventure together has, thus far, never been told. 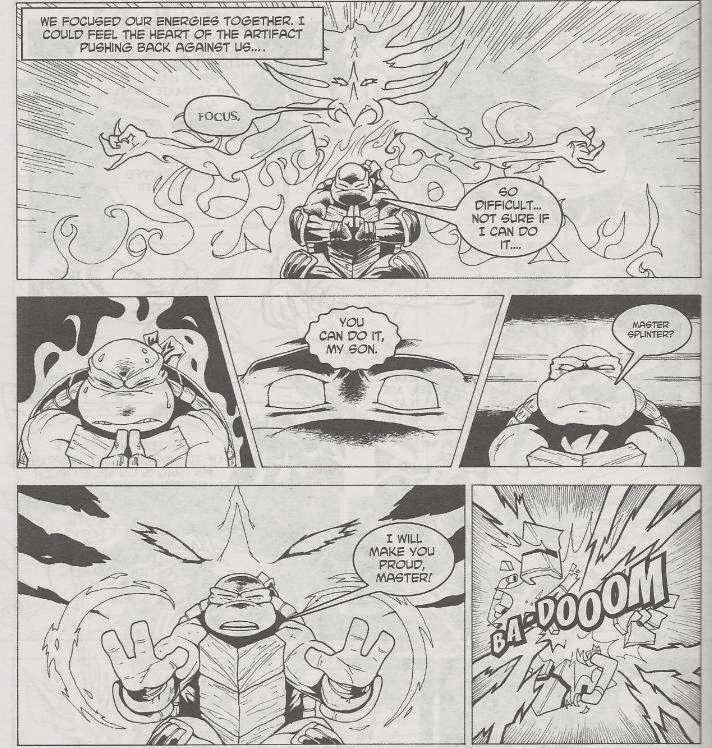 “Soul Survivor” is another in the long line of Donatello/Utrom space adventures that dotted the first half of Tales of the TMNT Volume 2. I think it’s among the better of them, though, and continues the theme inherent in almost all of those stories: Secret Origins. “Sins of the Past” looked into the origin of the Utroms, “The Blue Hole” investigated the source of all turtle life on Earth, and “Soul Survivor” now takes a gander at where the Triceratons came from (while also giving us our first look, chronologically, at the Styracodons). While the Donatello space adventure stuff might not be my favorite recurring setup in Tales, I appreciate that each installment kept a consistent theme that worked toward some excellent world-building. Donatello also receives another Utrom partner in the form of Bydex. Funny how Glurin stuck around, but none of these other guys did. They’re all pretty indistinguishable from one another, so I guess it just made more sense to give Don a dedicated Utrom sidekick instead of four of five nigh-identical ones. The ending hints at some greater partnership between them predating this experience and is another of those “In a Tales of the TMNT yet to be told” situations. And like many of those “as yet to be told” teasers, it was never followed up on. I enjoyed this tale quite a bit, though the ending feels rushed and spontaneous. White devotes 6 pages to Don’s battle with Major Tritan, but when we finally get to the climax, we have all of 4 pages to accept the concept of alien ghosts, a dissertation on the “Soul Capacitor”, the history of the alien’s people, and the resolution to the conflict. The pacing is way off and more time is offered to a meaningless battle with a minor inconvenience than the big finish which contains all the exposition to tie the tale together. It’s just… suddenly… GHOSTS! Deal with it! Shortcomings in the script pacing aside, White’s layouts and action staging are very nice. His lines are very crisp and the art reads especially well. While the extended fight with Tritan was gratuitous, it did look lovely (especially that two-page spread) and I dug all the little details on the Triceratons and Styracodons. White makes an effort to distinguish them from one another, so they don’t all wind up looking like doppelgangers (as many artists who draw the Triceratons are guilty of doing). I do wish he’d employed some shading or toning, as the stark blacks and whites leave the pages looking kind of empty. Like I said, the art reads well, but without any sort of grey tones it actually looks unfinished; like it was supposed to be colored. Anyhow, I’d say this was the best of the Donatello space adventures. The theme of secret origins is present, but it doesn’t overwhelm the actual adventure aspect and this is an action-packed tale. Perhaps a little *too* action-packed for its own good, but when everything else is put together so well I find I can let the rushed conclusion slide.